– Michigan Center avenged their only loss of the 2018 season in the pre-district with a 35-6 win over Cascades Conference rival Grass Lake. The Cardinals’ 2017 season came to and end against Lumen Christi with a 51-14 loss. – Lumen Christi ended the season ranked #1 in Division 6 by the Detroit Free Press. The Titans have not lost since 9/8/17 when they were beaten 22-21 by Battle Creek Harper Creek. Lumen Christi is the back-to-back defending state champions. Last season’s playoff meeting between these two teams was the first in history. Click here to listen to that game or any of our other high school football games. – The Western Panthers won the first playoff game in school history last week with a 21-14 overtime win against Mattawan. The Panthers only loss this season was to an undefeated 2-time defending Division 6 State Champion Lumen Christi team. 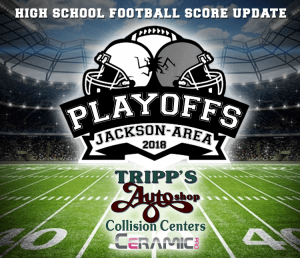 – Battle Creek Central beat Middleville Thornapple Kellogg 25-24 in the pre-district to earn their way into this game. The Trojans finished 3rd in their conference this season. I could find no information on previous meetings between these two teams.